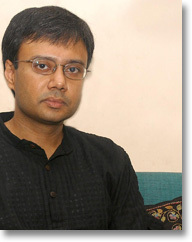 Born in Calcutta, India, in 1962, Amit Chaudhuri was brought up in Bombay. He graduated from University College, London, and was a research student at Balliol College, Oxford. He was later Creative Arts Fellow at Wolfson College, Oxford, and received the Harper Wood Studentship for English Literature and Poetry from St John's College, Cambridge. He has contributed fiction, poetry and reviews to numerous publications including The Guardian, The London Review of Books, The Times Literary Supplement, The New Yorker and Granta magazine. His first book A Strange and Sublime Address (1991), a novella and a number of short stories, won the Betty Trask Prize, the Commonwealth Writers Prize (Eurasia Region, Best First Book) and was shortlisted for The Guardian Fiction Prize. His second novel Afternoon Raag (1993) won both the Southern Arts Literature Prize and the Encore Award (for best second novel of the year). The novel adopts the metaphor of Indian classical music, the raag, to evoke the complex emotions displayed by the narrator, a young Indian student at Oxford. It was followed by Freedom Song (1998), set in Calcutta during the winter of 1992-3 against a backdrop of growing political tension between Hindus and Muslims. The US edition of Freedom Song won The Los Angeles Times Book Prize (Fiction) in 2000. A New World (2000) is the story of Jayojit Chatterjee, a divorced writer living in America, and the visit he makes with his son Vikram to his elderly parents' home in Calcutta. Real Time (2002) includes a number of short stories set in Bombay and Calcutta, some of which have been published in The London Review of Books, The Times Literary Supplement and The New Yorker, as well as 'E-minor', a memoir written in verse. D. H. Lawrence and 'Difference': Postcoloniality and the Poetry of the Present, exploring Lawrence's position as a 'foreigner' in the English canon, was published in 2003. St. Cyril Road and Other Poems was published in 2005. Amit Chaudhuri is Professor of Contemporary Literature at the University of East Anglia. He is editor of The Picador Book of Modern Indian Literature, published in 2001. He is judging the Man Booker International Prize 2009. He is also a musician.